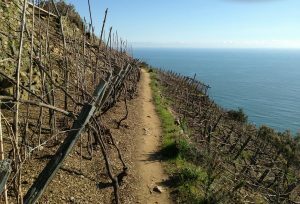 SciaccheTrail Vertical Race (SVR) was created to promote the wine culture of the Cinque Terre through outdoor recreation and informed consumption choices directed at the maintenance of the territory and a marginal economy. SVR is dedicated to raising funds to safeguard the amphitheater of giants: the Manarola Cinque Terre Foundation aims to “protect the landscape, the rural culture, the traditional agricultural production” and in particular, the area surrounding the village. A true natural amphitheater. A portion of the registration fee (5 euro) will be donated to the Manarola Foundation to realize recovery work of abandonded land. The risk of hydrogeological damage – unfortunately widespread throughout the region of Liguria – takes on a special significance where landslides threaten population centers. This is precisely the case with Manarola, where the Hill of the Three Crosses (made famous around the world by hosting the illuminated nativity of Mario Andreoli), once completely cultivated, is now in a state of deterioration, made progressively worse by the abandondment of cultivation and the consequent lack of maintenance of the dry stone walls. 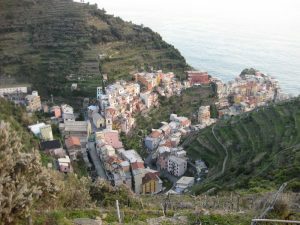 The community of Manarola felt the need to set up a “FOUNDATION” whose purpose is to raise funds for the recovery of terraces in the area known as the “Amphitheater of Giants“. The primary purpose of mitigating the risk to the village of Manarola melds perfectly with the need to safeguard an extraordinarily beautiful corner of the world where, while walking on the seaside trails, at a glance you can appreciate the uniqueness of this landscape built by man over centuries and you can understand the delicate balance between man and nature of which in the Cinque Terre you find one of its greatest expressions.